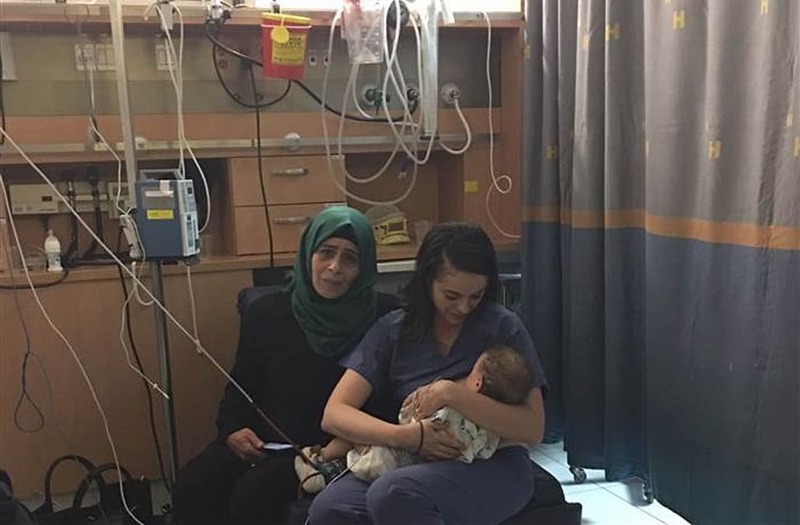 An Israeli nurse won the hearts of millions after she was photographed breastfeeding a Palestinian baby boy whose mother was critically injured in a car accident. According to TODAY, a Palestinian family of three was involved in a horrific collision with a bus in Jerusalem earlier last week, killing the infant's father and seriously injuring the mother. Yamen, the couple's nine-month-old baby boy, who was also restrained in his car seat at the time of the crash, survived with minor injuries -- but he was quickly growing hungry. Exclusively breastfed by his mother, Yamen reportedly refused to drink milk by the bottle and had been crying for seven hours. So his aunts, who arrived at the emergency room later, pulled aside nurse Ola Ostrowski-Zak to ask if she knew anyone who could breastfeed the child. As it turns out, Ostrowski-Zak, who is also the mother of an 18-month-old boy, was able to feed the child herself. "That was my first instinct," Ostrowski-Zak told TODAY. "I thought to myself, 'I must help this baby.'" Ostrowski-Zak said her offer left the aunts in awe, saying they would have never expected a Jewish woman willing to do what she did. "I was emotional about this sad assumption," Ostrowski-Zak said. "I know any Jewish mother would have done the same." She said Yamen quieted as soon as he began feeding. "I felt a unique connection with him," she said. "It felt pretty similar to feeding my own son Ayam." Before ending her shift, Ostrowski-Zak took to an Israeli Facebook page to ask for volunteers to help feed Yamen. She received over a thousand likes in the course of two hours from women across the country willing to drive more than 50 miles to feed Yamen. "This story represents the real Israel," Ostrowski-Zak said. "Any mother in Israel would have helped him. The human connection is very strong."